Starting to use stethoscope. 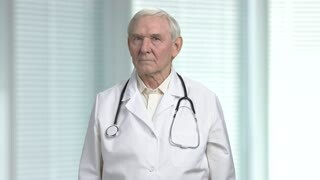 Senior old doctor with a stethoscope in the hands on white windows background. Very old senior physician talking on phone. 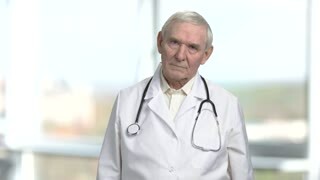 Portrait of doctor with stethoscope talking on phone in bright blurred windows background. 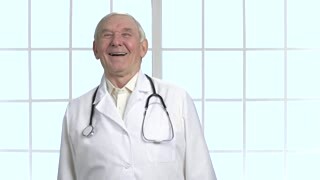 Positive cheerful senior doctor talking on the phone. Portrait of old physician with stethoscope talking on smartphone. Bright blurred windows background. Stressed old angry physician having headache. Senior health care professional doctor with stethoscope. Blurred windows with louvers background. Experienced old senior doctor with stethoscope. Laughing hard, very funny. Bright checkered framed windows background. Old doctor get rid of excessive sweating. Portrait of frowning senior doctor with stethoscope. Bright windows background. 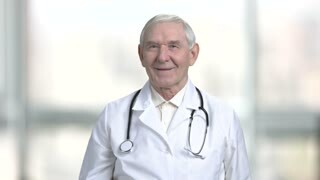 Senior old doctor in white coat and stethoscope shows thumb up. Fist with thumb up turning rotation, blurred windows background. Handsome senior old doctor in white coat and stethoscope is talking on the mobile phone in hospital. Bright abstracrt blurred windows background with view on city.